In high wind and cyclonic areas, it’s sometimes necessary to engineer your garage or industrial door a little differently to ensure it withstands the particular stresses it may be subject to. Steel-Line cyclone garage doors are ideal for use in homes, sheds, commercial and industrial warehouses in high wind prone areas. 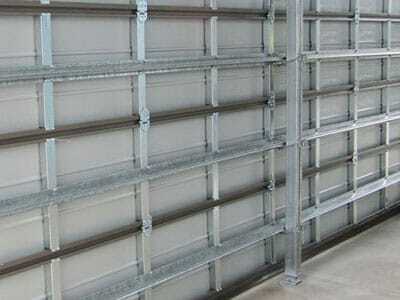 The National Construction Code (NCC) 2013 – Housing Provisions (Building Code of Australia Volume 2) includes a reference for garage and large access doors for Region C and Region D to comply with AS/NZS 4505 – 2012 ” garage doors and other large access doors”. This came into effect on 1st May 2013. Steel-Line Garage Doors has re-engineered our wind rated garage doors and had them tested at the James Cook University against the wind loading requirements as laid out in the updated AS/NZS 4505-2012. The Strut-Lock door is post free, incorporating the use of heavy duty struts, robust commercial hinges, top brackets in combination with a unique stile reinforcement to provide maximum resistance to forces exerted by cyclonic and high winds. 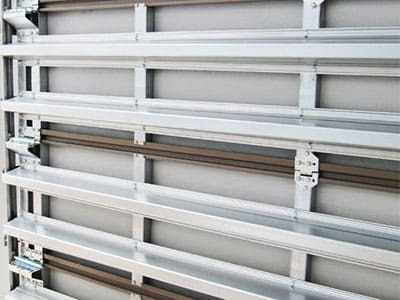 The Steel-Line Wind Brace system incorporates the use of removable steel wind brace post(s) that is installed to the garage door once a cyclone warning is received. It takes about 2-5 minutes to install, and no tools are required. The door construction incorporates a number of significantly enhanced items, which still ensures a smooth door operation. However when used in combination with the removable wind brace posts, it enables your sectional garage door to withstand high force wind conditions and dramatically reduces the potential for the garage door to sustain damage and blow in, or blow out, event. The patented Steel-Line Windlock system incorporates a moulded lug secured to the door curtain, which interlocks the matching shaped side-track. 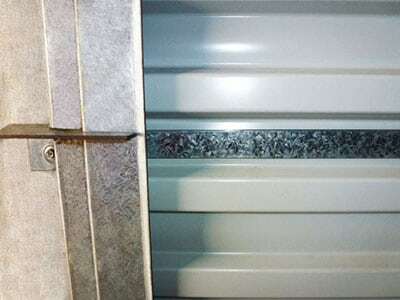 The design ensures smooth operation and minimises air infiltration enabling your roller door to withstand high force wind conditions and dramatically reducing the potential for the door to sustain damage and blow in. Our patented Windlock system also serves as an extra safe-guard against break-ins because the curtain cannot be easily pushed in helping to prevent unwanted entry.